In the first week of August, fieldwork took place at Southwood Activity Centre, Tolworth, as part of a community archaeology project organised by the Kingston Archaeology Society (KuTAS), to study the history of the Hogsmill River. The Society was delighted to receive nearly £30,000 of Heritage lottery funding to undertake the fieldwork, as well as producing a publication, and museum exhibition linked to the research. The site occupies a narrow strip of land, which runs along the southern bank of the Hogsmill River. Not all of the area was accessible due to tree and scrub growth, but approximately one third of the 4.5-acre area was investigated. It was with great excitement that the fieldwork began, after many months of meticulous organisation and planning. The wide variety of site tasks were dealt with smoothly and efficiently by a team of 20 adult volunteers, primarily KuTAS members, who worked incredibly hard during the course of the week, to ensure the fieldwork was a success. The volunteer team was supported by professional archaeologists from Surrey County Archaeological Unit, Pre-Construct Archaeology, and Reading University, who were on hand to give advice and training where required. One of the key aims of the project was to provide training for local youngsters in archaeological techniques, and allow them to explore their local heritage in a fun and safe environment. Most of the fieldwork was therefore undertaken by scouts and other local youths from the Kingston and Surbiton areas, and during the course of the week a total of 35 youngsters joined in the activities. 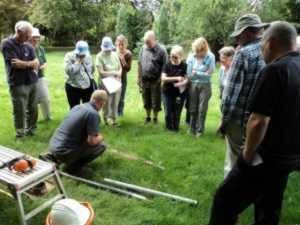 The fieldwork was wide ranging in its scope, as it covered not only recording the archaeology of the recent past through surveying, test pitting and metal detecting, but also looking back further through time at the development of the Hogsmill River from cores obtained by a borehole survey. The results from the borehole study showed that a sequence of river laid deposits, up to five metres deep in places, was present across much of the site. Initial observation of the gravel and sand sequences, suggest the river (either the Hogsmill in its early form, or another Thames tributary) was larger and faster flowing than its modern counterpart. A peat deposit within the sequence is of particular interest as it should provide an opportunity for further analysis of pollen and organic remains. The geoarchaeological laboratory analysis will be undertaken by students at Reading University over the next 18 months, and the results will be published as an academic report. The cores also showed that the uppermost layer of the site (up to 1.5 metres) consisted of a thick clay deposit, which may partially be the result of dredging and river canalisation. This meant that the test pits did not reach any in-situ archaeological horizons, and were very hard work to dig! A number of post medieval finds were, however, retrieved from the topsoil, and the test pits provided an excellent opportunity for training in excavation techniques. 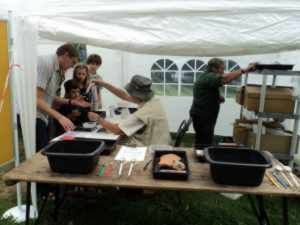 The metal detecting survey focussed on clearing the huge amount of post medieval and modern finds from the site, and proved to be a favourite activity for young and old alike. Finds of note included a lead token, a musket ball, and a pendant with a sundial and French lettering that may have a military connection. Analysis of the finds is ongoing, and a report on the fieldwork and finds is in production. The fieldwork culminated in an open day for local residents, who were able to see the boreholing and digging in action, find out about the project and the results of the work, and also have a go at various activities including metal detecting and finds washing. The open day was a great success with over 120 visitors, and many of the youngsters involved came along to help and work on the day.